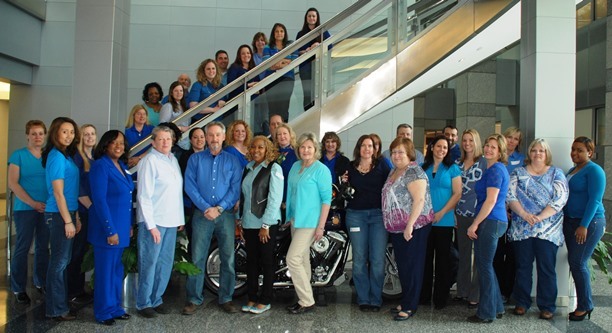 IAM staff wore blue shirts and jeans on April 2 to kick off Autism Awareness Month. Most everyone knows a family affected by autism, or is dealing with the disorder in their own household. Machinists Union families are no different. The latest statistics from the Centers for Disease Control identify around one in 68 American children as on the autism spectrum. During the month of April, which is recognized as Autism Awareness Month, IAM Headquarters in Upper Marlboro, MD, will be helping educate people about the disorder and hold numerous fundraising events. On April 2, the United Nations-sanctioned World Autism Awareness Day, Headquarters staff wore blue as part of the “Light it up blue” global autism awareness initiative. The kick-off event raised $255 for Autism Speaks, an advocacy organization that sponsors research. The Grand Lodge will also be hosting a potluck barbeque lunch sale and raffle to raise money throughout the month. A representative from Autism Speaks will be giving a presentation to the staff later in the month. Click here for more information on how you can get involved in Autism Awareness Month.